If you aren’t yet familiar with the Philadelphia Flyers‘ new mascot Gritty, consider yourself lucky. This terrifying abominable (abomination is more like it) snowman mixed with Carrot Top made his debut recently and the internet exploded. People compared him to Animal from The Muppets and the source of future nightmares for Philadelphia-area children. That’s why it makes perfect sense that a brewery is making a beer in his creepy, hairy honor. 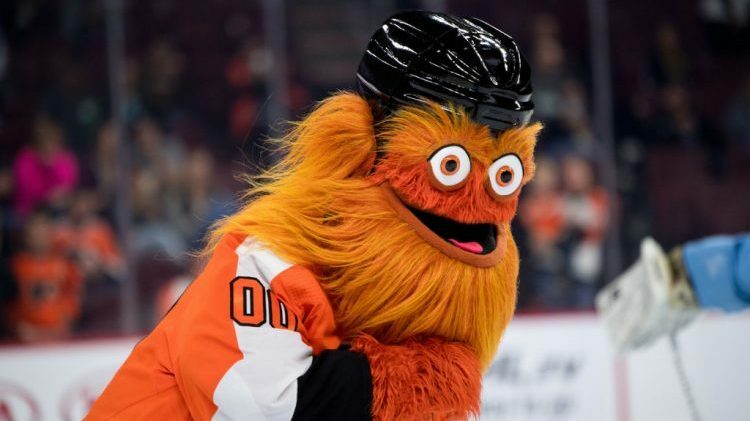 The NHL is calling Gritty “the ultimate Flyers fan who loves the orange and black, but is unwelcoming to anyone who opposes his team.” Broken Goblet Brewing in Bucks County, however, considers him nightmare fuel, and that’s the name of their new, limited-edition beer. Nightmare Fuel is a “a lightly hopped cream ale brewed with vanilla and ‘bruised and bloodied’ oranges,” according to the brewery’s Facebook page. It’s gets its hop flavor from Chinook and Saaz hops. It will be available on Oct. 13th in limited-edition crowlers (with real googly eyes designed to mimic the crazy eyes of Gritty) and on draft. The label is horrifying, but the beer itself actually sounds pretty good. Because this is not a collaboration between the Flyers and the brewery, you might want to get a crowler as soon as it’s available because who knows how long it will take for the furry, haunting, creature (read: a lawyer) to show up and put an end to everyone’s fun.